My friends, Real in LA and the Irish Princess, Tanya, and I are meeting up in Jordan for a little Thelma and Louise adventure in the desert. Acting as tour guide, I pulled out my Bible, the RSV version Pastor Dell gave to me for my confirmation. Looking through the maps at the back of my Bible, I choose The Exodus and The Conquest of Canaan because it outlines the King’s Highway. This trade route has been the primary link between Damascus and Egypt for thousands of years. We will follow it south as my friends want to visit the Nabatean capital, Petra. 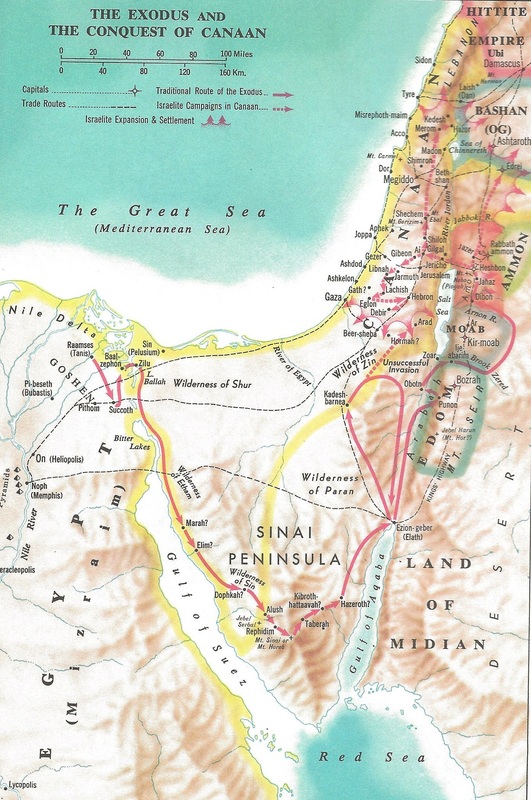 Although the incense traders’ Rose City is noted, we will follow the King’s Highway south to Aqaba, then turn left into the Land of the Midian. Calling around, I found a man who will provide us with some camels and tents once we get there. He promised to meet us in Rum for a cup of tea before heading out into the desert. The highway will take us through the kingdoms where the dreaded polytheists – the Ammonites, Moabites, and the Edomites – lived. If we get in a tricky spot, I will follow this guy’s lead and sing Carrie Underwood’s Jesus Take the Wheel. You are amazing… you don’t miss ONE drop of life… go for the gusto girlfriend!! Gotta see the original Moabites. It’s a balance of adventure versus comfort – excitement versus sheer terror. And having something to write home about.